Natural movement is progressive. You don’t suddenly morph into a skilled, efficient, natural mover when you are born, or reach some arbitrary milestone in life, such as adulthood. On the contrary, the acquisition of movement skill and adaptability is a relatively slow process. Furthermore, it cannot be rushed without consequences. Similarly, nobody becomes physically weak and dysfunctional overnight either. It’s a slow process that takes place over the course of several months, years, or even decades – most often from disuse and/or misuse of our body’s natural abilities. In our society, it’s all too common for the pursuit of constant comfort to inevitably regress into being uncomfortable constantly! The good news is that we can progressively change and improve our overall circumstances, habits, behaviors, and environments, which leads to progressively restoring and eventually enhancing our basic functions. And one of the keys to success is progression, which ironically, is often the opposite of what most people do when they suddenly decide to make a change or “get in shape.” In fact, many long-term “neglecters” often become short-term “brutalizers” in an effort to undo all of the damage they’ve done over a lifetime – completely ignoring the principle of progression by trying to restore their health and fitness in just a matter of weeks. The truth is that if your lifestyle has progressively created a dysfunctional body and movement patterns, then the journey to reclaiming your health, movement competency, and fitness should start with progressively shifting your course to the right direction. And ideally, with increased movement quality and frequency rather than increased movement quantity and intensity – at least, in the beginning. But maybe you’ve bought into the idea of “no pain, no gain.” Many have. But what they usually end up with is a LOT of pain and a huge loss in health, mobility, and capability, among other things. This is what often happens when you ignore the progressive principle, along with all of those biological signals the body uses to tell us to slow down or stop doing something that’s causing more harm than good. Now, adaptation by its very nature, is progressive. So, if you want to move better, get stronger, or improve your health, it’s not going to happen overnight. It takes time. And knowing this gives you a tremendous advantage in these pursuits. Instead of “brutalizing” yourself, you can make sure that the inputs (i.e. stimuli) necessary to trigger such adaptations should also be progressive – not only to ensure the best adaptation possible, but also to avoid injury. So, the dosage matters immensely over both the short-term and long-term. The right dose should be incrementally increased regularly while being consistently administered. So, transformation is not a single event, but the result of a succession of efforts, made through constant attention. It’s a conscious process that rewards the dedicated. For example, a very organic progression naturally takes place in children as they learn to move better and better through the acquisition of new, more difficult movement patterns – starting with the simplest, and progressing to more sophisticated movement patterns. Do children start doing pull-ups right away? Not at all. They start hanging. They hang often. They hang longer and longer, and in many diverse ways. They hang and swing. Finally, they start pulling themselves up as they climb, often using their legs. 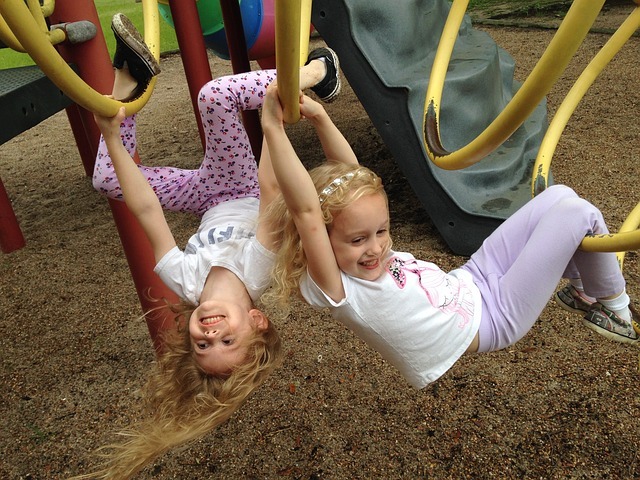 That’s how they build their grip strength, upper body strength and coordination…by climbing! So, why rush as if pull-ups were the “end-all-be-all” of upper body strength and fitness or because it is an essential “functional movement?” It is not! A pull-up is one of many climbing movement patterns – each of which offers unique practical, functional, fitness and conditioning benefits. So, why rush to master pull-ups when adults often actually have proportionally less strength than children? Adults should restore the function they have lost (or maybe not even ever developed in the first place) before they try to enhance it. The same reasoning that goes for pulling up applies to the full scope of Natural Movement skills. The idea is to first address the integrity and efficiency of basic movement patterns before new or more challenging versions of the same types of movements are practiced. For instance, hang before you swing, and swing before you pull up, etc. Or, crawl before you walk, and walk before you run. And the great thing is that if you respect this principle of progressiveness through sound progressions, you will not need “regressions” because you will start with the proper foundation and gradually increase the challenge from there. Now, implementing the principle of progressivism with movement skills/techniques (or “exercise selection,” if you prefer) is one thing. But we must also incorporate it into our programming, too, by way of administering the proper dose of volume, intensity, and complexity. There are many ways to accomplish this, and much could be written about it. 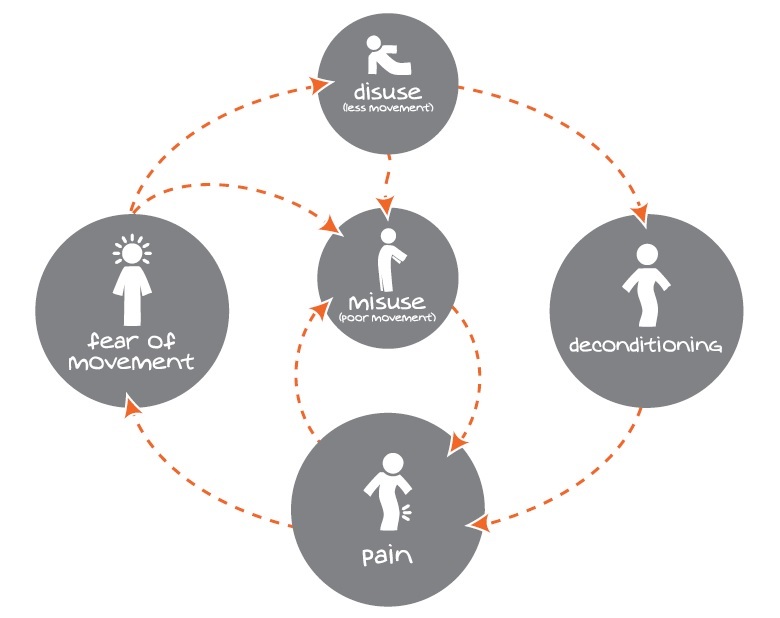 In fact, I’ve written at length about this very topic in my upcoming book, The Practice of Natural Movement, which also covers the many other aspects of the Progressive Principle, such as recovery, which is another critical factor. So, instead of going into great depth here, I’ll provide you with a few examples of implementing progression in your programming. 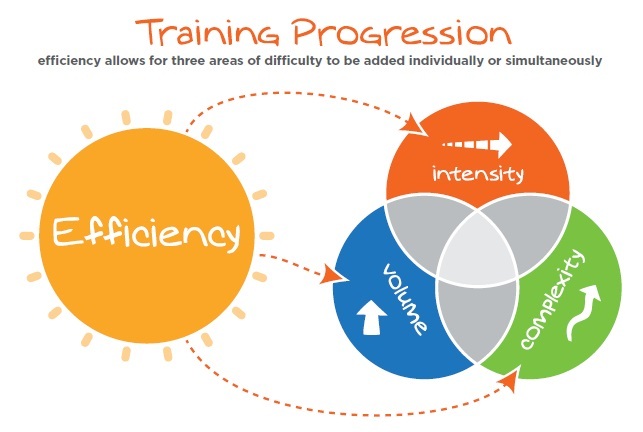 Increasing Volume – Doing more repetitions or spending more time performing a movement in any given practice session or day. Intensity – Increasing the speed at which you perform the movement (e.g. running faster), and/or the load moved during a movement (e.g. lifting something heavier), and/or the height or depth at which your perform the movement (e.g. jumping higher or further). Complexity – Changing the environmental demands, such as running on uneven terrain and/or gradually more difficult terrain instead of a flat, smooth track. Regardless of the aspect of progression you are looking at; volume, intensity, complexity, or frequency (etc. ), progressions must be well-thought out. When progression is not respected, movement efficiency, mindfulness, and even safety become difficult to maintain, which puts you and your results in jeopardy. So, the level of challenge should be incrementally increased regularly while being consistently administered. A good indicator of the proper dosage of progression is always ensuring consistency in movement efficiency. An important point is that consistency does not necessarily imply progression. However, progression always implies consistency has taken place. That’s because the path to progression – in movement efficiency or physiological adaptation – demands consistency. There’s no way around it. A lot of people become discouraged by diverse failed attempts to remedy their issues, be it in term of health or physical condition, thinking that they have literally tried everything. However, they’ve failed to realize that it is their lack of commitment to progression that prevented any improvement to last or even happen in the first place. The truth is, every day, you can shrink a bit more or improve a bit more. And you can only expand your comfort zone by challenging it. So, start by challenging your comfort zone frequently so you can expand it gradually. Likewise, practice should never be too easy or too hard. When you find the “sweet spot” in the middle, which can only be done with the principle of progressivism, you’ll be amazed at the progress you can make in both the short term and long term. And if you think pursuing strength, health, and better movement competency is too hard, takes too long, or demands too much commitment, consider the alternative: weakness, disease, and helplessness. 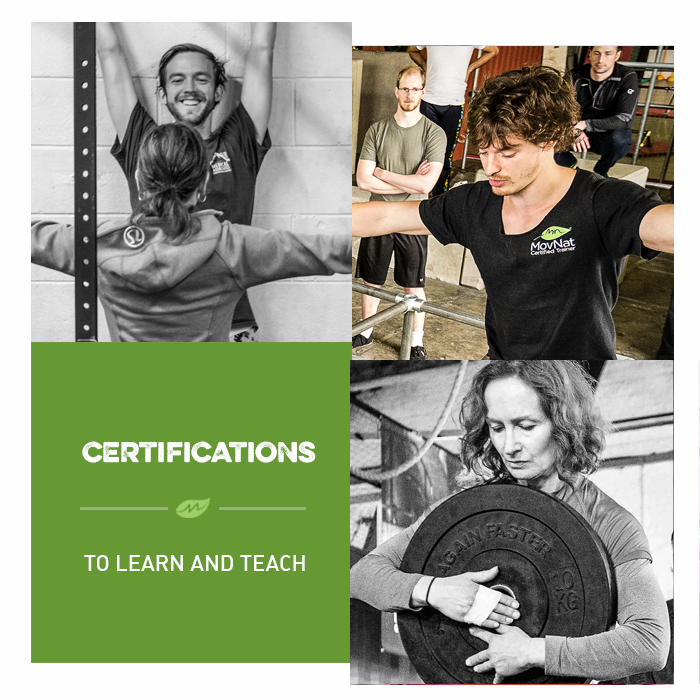 If you’d like to learn more and deepen your movement practice, consider attending the MovNat Level 1 Certification. We hold events all around the world.